Part of my 3rd grade curriculum includes drawing a figure in action. 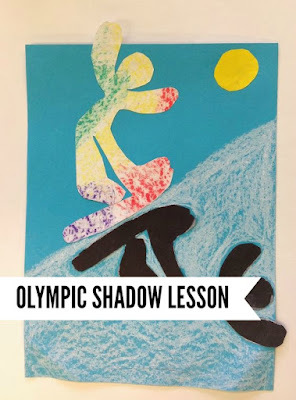 I usually combine that with a reminder lesson on shadows and this time I decided to forgo my usual self portrait drawing for something more Olympic themed. 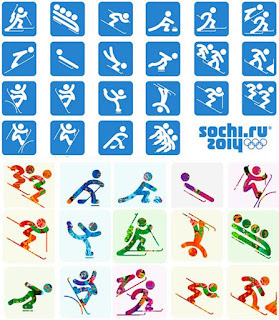 Sport Pictograms are an Olympic tradition. 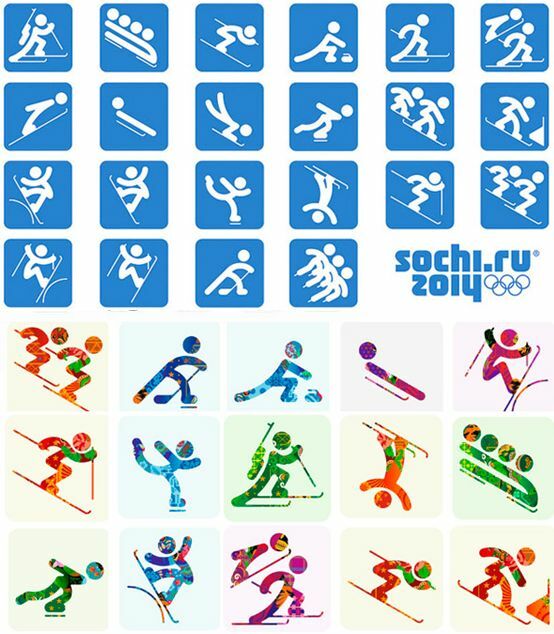 These pictograms are simply picture icons that identify each sport. As I told my kiddos, one not need to speak the language of the host country to be able to know what sport a venue holds, like any symbol it should be universal. I was happy to see that they are using these pictograms on the television broadcasts as well. First I had them use some texture plates and gave them 2 minutes to color their 6x9 white paper with colorful patterns. I did not tell them what they were for. Then, after our brief discussion on the history and usage of pictograms or glyphs I gave each student a mannequin. Quickly one at a time I flashed the 'official' Sochi pictograms on the board and the student was to manipulate the mannequin into the movement/position of the icon. Some were easier than others! Once they were satisfied with their drawing, they stapled their white paper to the black 6x9 paper and cut out both shapes at once. 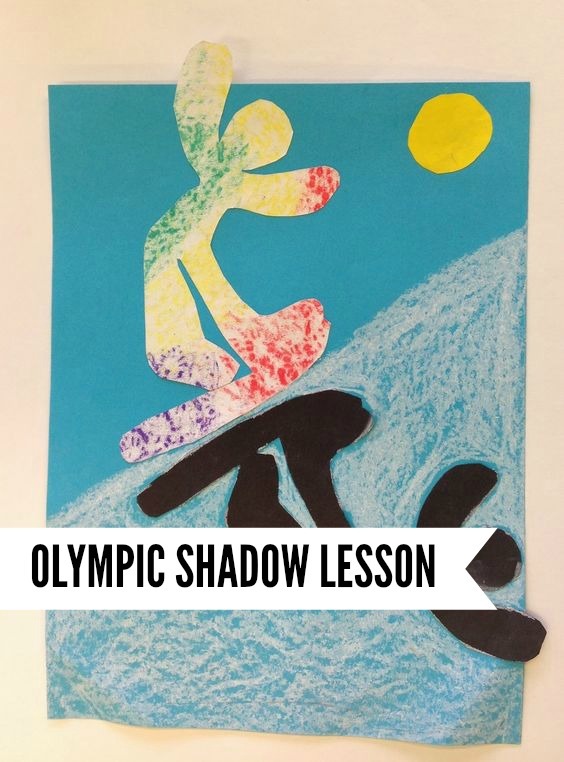 The students were instructed to think about placement on the page to include their shadow and any snow, ice or mountain that might be needed. Finally the sun - you must have a light source if you have a shadow! - was placed in the sky. I absolutely love how these turned out. Use them for any winter sport as well! Oh, these are great! I love the action in each and the shadows, too! I'm going to try this one! Pam - My pictures went missing for several months and this post was dead. Glad you found it!! This is such a wonderful lesson! I was searching for an idea to use with my 3rd graders. This is perfect, thank you!! I was looking for ideas for symmetry art lessons and came across your wonderful lesson. Totally ties in with Winter Olympics 2018, which is starting tomorrow. Thanks! 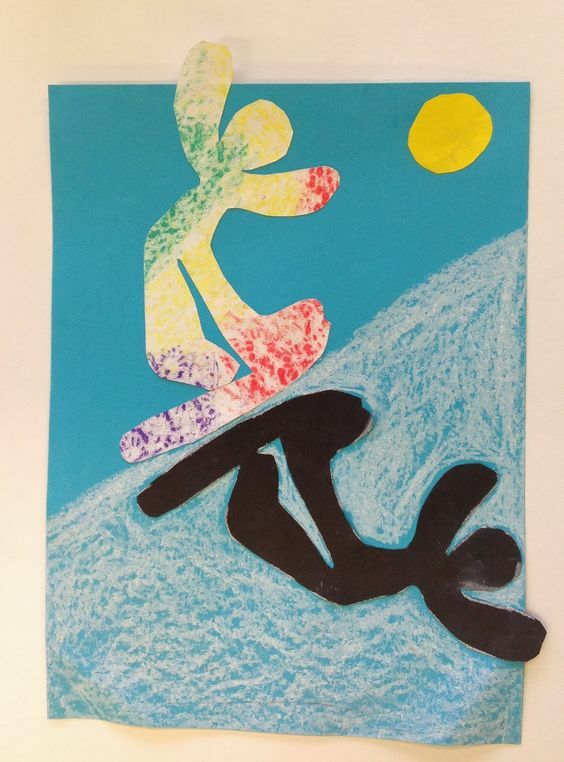 I have been teaching Art at the same school for 16 years. It's so awesome to see children grow from Kindergarten all the way to 8th grade! I really enjoy incorporating History and World Cultures into my lessons. I love finding new ideas from bloggers and hopefully you'll find my projects and classroom ideas inspiring to you. Let me know if you like something special and thanks for stopping by! An artist talks with pictures!